In my Template of Terror I do a look at some of the expansion of terrorism world wide, and Hezbollah operations in the New World is a nasty deal. They are, in all probability, working with the various drug lords in the region and working hard to get a good cash flow via the narcotics trade and weapon supply business. This is extracted off of the litany of terrorist attacks from Wikipedia and I did have to end the article as I had reached the end state for my supposition. I went a bit further on today to look at the North Korean infusions into the entire Transnational Terrorism and supply business via the supernote. The end of that is to give suppositional 'dot connecting' between the use of the supernote to enhance the spread of weapons, manufacturing capability and terrorism by giving a slow, but steady cash infusion of counterfeit $100 bills into that system. That web stretches far and wide, even into legitimate banking services. Hezbollah is just the head of a nasty weed that is supported by this ever widening infrasturcture and web of underground trafficking. Once information gets into circulations, like the AQ Khan nuclear blueprints, it is then available to *other* webs of such transfer via the common players crossing the webs between illegal State sponsored terrorism, home-grown terrorist webs (like al Qaeda) and normal criminal underworld operations. The fungibility of money between these networks for goods, services and information is pestilent in the extreme and is beyond what military, law enforcement or treasury can handle. If you don't like Hezbollah *today* just wait until Iran can supply them with upgraded missiles and rockets using better North Korean or other source upgrades. 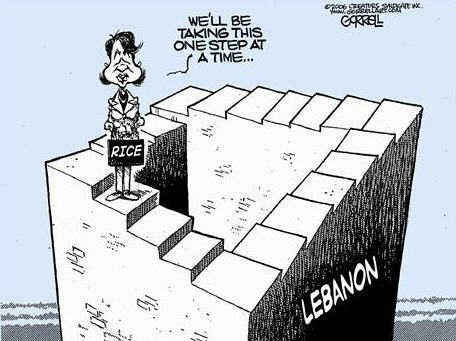 Lebanon I am starting to think of as the interdiction launchpad for Iran. That is why it can so easily threaten the Arab world. Give in now, and Iran holds the Eastern Med shipping hostage and can assault anyone within range of their long range rockets. THAT is what Israel is fighting to bring down. And it MUST be brought down. Give in now, and we will start to see global trade transiting through that region either threatened or having to pay a movement *tax* to Iran. "You can pay me now or you can pay me later, but you'll pay me. When you pay me later it'll cost you more." The same can be applied to your Weed Theory. We either sack up and Round-Up the weeds now, or they'll be back later -- stronger, bigger, harder to kill. We make a HUGE mistake if we do not make the clear link that this is ALL INTERCONNECTED and that a focus on one area is no guarantee that another area will be affected. As President Bush was wont to classify immigration, this WAR needs to be COMPREHENSIVE on MANY fronts simultaneously. Mr. Z - And the front that also needs addressing is the HOME front. That lack of National Security endangers us just as surely as does Mr. Kim in NoKo with his counterfeit money or as much as al Qaeda schemers do. We can help our friends, but we should HELP OURSELVES also. What is the President's Foreign Policy? His domestic policy? National security outlook? Does he *have* any of those... beyond the good people he brought in to help him, what is HIS outlook? And why can he not find some way to give it voice? Is it missing... he has had since 9/11 to state his complete outlook on foreign policy and how that interacts with domestic affairs. He has not done so and pointedly. The President gives more than mere *directions* to the government... he gives DIRECTION for the Nation. Part of that direction *must* be to STAND with Our Friends and Allies who have often sacrificed much on their own to be a Friend or Ally. And for Us to be worthy of that sacrifice, We must stand with them through thick and thin, good and bad and support and keep the back safe of them who do the same for Us. Who was the LAST President to say that and carry through? Ronald Reagan comes to mind... then the years flit past... for all of what Nixon did, he did not do this... Johnson tried and failed, and in that failure has continually put a corrosive sore upon the Nation... Kennedy tried and taken from us before we could see his long-term goals... those missing on this agenda in recent years are from BOTH PARTIES. Is it too much to ask that the Nation honor those that honor Us? Condi can bring *direction* but she must take orders from her boss on which direction that should BE. She does not wish to twist in the wind... but this is no better. A pointless visit to the Muddle East instead of a *pointed* one. She has much stature in her doing, but the task given her is not worthy of her or the Nation. That's precisely what you've been saying all along; policy and its delineation. And I'm 100% with you on your home stance. And I'm a firm believer that there is NOTHING wrong with solving problems at home first -- or at worst, simultaneously. Political correctness and the inability to make judgmental and discriminatory decisions on a national scale could be a massive downfall. And you are again correct; we must STAND UP and PUBLICALLY ANNOUNCE and IDENTIFY our friends, proclaim them to the world, and then do our best to bring them into and encompass them into a coalition of forces willing to take a group stand. That is why I indicated she was confounded; it's not of her own doing; she is but the messenger attempting to portray what she is instructed. If you are looking, BTW, for a very clear voice with regard to Israel (and someone who thinks Israel is wimping out), check out the blog of Yoni Tidi at Townhall.com. Great insight. I'm with you! Tell it! It's getting late in the game to be telling the Western players what the rules are. Or who the opposing players are! 'Kill the terrorists' should be an easy rule to follow. Benning: welcome aboard, it's good to see you here and please come back any time. And yes, Benning, I am starting to sweat -- I am becoming very concerned that we have, still, not yet clued in. We have still not clued in, because so many Americans are so "clueless"! It's an excellent post, BZ. This entire thing is extremely frustrating. Israel has to win; Hezbollah must be broken, stomped on and ground into dust! Yes folks, so correct -- the reason for my saying that this is a massively-precarious point for our nation, Israel and the world -- equally if not moreso than the Cuban Missile Crisis. In my opinion this is The Crossroads. What we do here, now, will determine so many futures we should have embraced or could have avoided. Well, after doing a quick bit of thinking we can now see that Hezbollah is the Foreign Legion of Iran and their money for military training has been put into that realm and not their own, interior, forces. Rule by direct proxy... so as to threaten the entire Middle East, South Eastern Europe and Turkey via Lebanon. More than just their fingers in the cookie jar, but an entire arm, it now appears. Perhaps it's time to ignore the Libs of the far Left and concentrate on the majority of Democrats who do not believe we should jettison Israel, and don't think the Terrorists are just misunderstood Freedom Fighters. I refuse to accept that nearly half of the American populace is so befuddled and self-serving that they cannot discern Evil when it is flourishing. There must be a way to get them out of their comfort zone as Democrats and into the front lines. Question is: How? Hey, I linked to this post. It's a good 'un! Benning - I had to put together my political party of One to help address those read out of the Democratic party in 1968-74. They took the party in a direction that did not honor its founder or the Nation and has lost its capability to connect with those voters. Of what remains in the Democratic party it is true that it has a fair number of 'Kennedy liberals' that really do not like the vehement Leftists in the party, but they are seeking to inherit the Earth, being meek. It is interesting to look at actual population and voter demographics and see the exit of those people who were once Democrats, and it has been and still *is* remarked upon. That swath of the population, between 20% and 35% joined the 'prennial disaffected' 5% to 10% so that we now regularly see 25% to 45% or more of the population not voting. I have looked at this with Welcome to the Zero Party State and with The Twilight of the Two Party System to see a political system moving starkly *away* from the actual moorings of the system it is supposed to represent. The US is *not* a 50/50 Nation... is is a 30/30/30 Nation with one segment so disgusted with the state of affairs that it refuses to support the parties. And because of the non-pushiness of the ideology of those people, they do not believe in forming up political parties... especially when the party of their Founder has been hijacked and they were told they didn't matter. Strangely, these same people *support* the Nation by enlisting in the military, taking Federal jobs and otherwise ensuring the Nation runs. That is honorable work. And that is the problem with the current state of affairs in politics: it is dishonorable on *all* sides. Thus these folks are stuck voting for honorable *individuals*, but do not assert policy or other such things as they really do not like the idea of mandating things for other people in any way, shape or form. A Party of One is honorable, as the person running it is agreeable and knows what he or she thinks. And reaching out to *individuals* each of their Own Party of One and coming to common cause is seen as an honorable way of addressing the problems of the Nation. To do this requires a change of mindset away from *parties* and to the Republic and ensuring it endures by common action and common good seen by the majority without hurting others in that doing, save the enemies of the State. Jacksonians are simple in their conceptions, but not simplistic in their outlook. From good and honorable roots and ideas come laudable outcomes or at least ones that are understandable in their doing and can be fixed if problems arise. A 'permanent' solution sounds to much like 'a final solution', and we are not here to do that... we are enjoined to make a *better* Nation and strive for perfection in the knowledge that we shall not reach it and the job will be passed on to those that come after. Those simple concepts are no longer represented in the politics of the Republic, by any party. And those are the 30% that understand that this needs be done... get the word out in a fashion that is honorable in its doing and upholds the honor of the Nation and Our Friends and Allies, and you *get* 30% of the population and suddenly it is no longer a 50/50 Nation. Understandably, both parties are incapable of doing this as it would mean becoming *serious* about something beyond mere talking points. Benning: I fear the only way to shake the country sufficiently is to encounter another 9/11-like day. Too many persons in the US are living a 9/10 life in the true 9/11 world.